Our award winning ales have become renowned for their unique flavor profile and consistent quality. Steelhead Extra Pale Ale and John Barleycorn Barleywine have received gold medals at The Great American Beer Festival, the most prominent award in our industry. 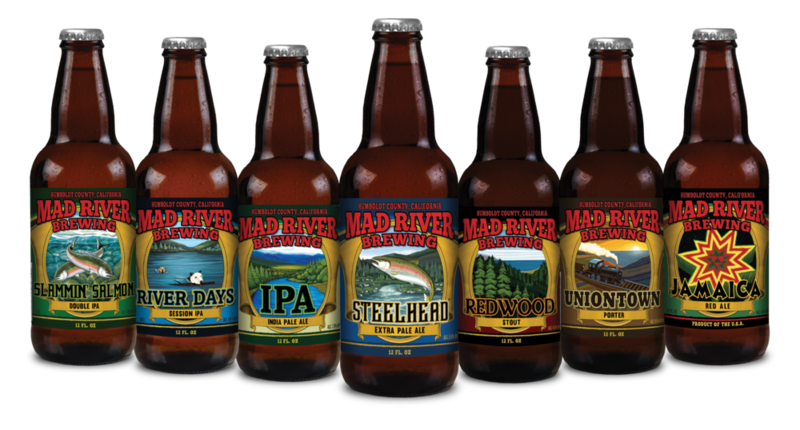 Mad River is perhaps best known for our Steelhead Brand Ales, including our flagship Extra Pale and our Extra Stout, a Scotch Porter and Double IPA. We also produce the popular Jamaica Brand, originally produced for the legendary Reggae on the River festival in Northern California. Our annual fall seasonal release of John Barleycorn Barleywine is very limited, eagerly anticipated and quick to sell out. In 2009 we added the Artisan Reserve Series which includes Serious Madness Black Ale, Double Dread Imperial Red Ale, and Humboldt Haze Imperial Wheat IPA. All equally received by our customers.